This project is the result of my frustration and desperation in my dating life. I wanted, and still want, a life partner, so badly that it hurts... I reached a point where new ideas for art performances were not even coming readily because I was solely focused on my love life. Thus, this past summer, I decided to go to events that I would normally go to hoping to find someone and tied a laminated sign on my back that stated my intention. 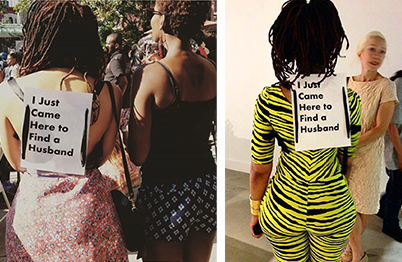 In fitting with my usual performance practice of physical and mental endurance I walked for 2-4 hours wearing the sign (sometimes in the hot sun) all while answering personal questions, listening to romantic advice, posing for photos upon request, and explaining my performance practice. Next, I made the 50 limited edition t-shirts on sale here because people asked for them. The same people who high-fived me when I performed the piece publicly wanted more from the project. I see the making of this performance art (object) as a self advocacy that is also inviting viewers/the public to my private immaterial-space and hopefully it will generate a successful 'participatory' mission: to become an active part of this performance and find a life partner. Being that this is a life goal that I previously tried to conceal, this project exemplifies what happens if you let everyone know what you are trying to hide. For more on this performance project visit: madamenior.com and theroot.com. 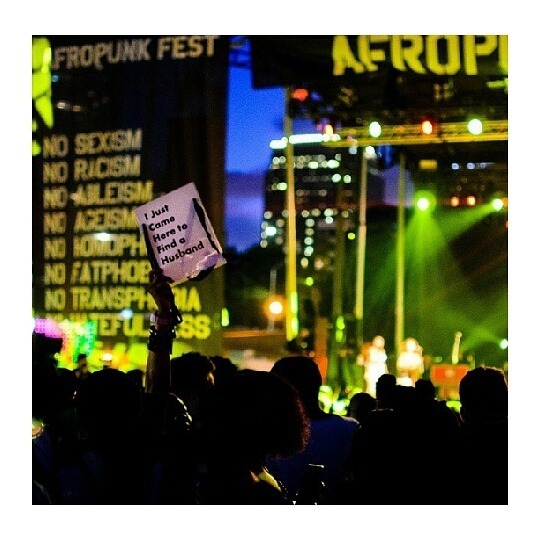 Sign worn (above) at AfroPunk, (bottom left) at Spike Lee Black Party and (bottom right) at art opening with Gateway Project Spaces.